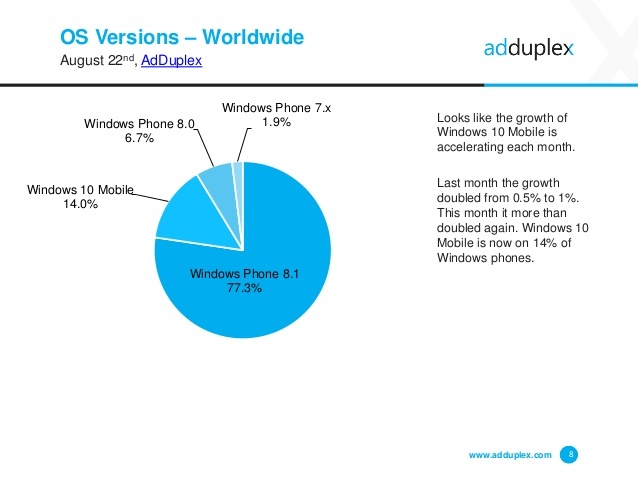 The AdDuplex Windows device statistics for the month of August is out. 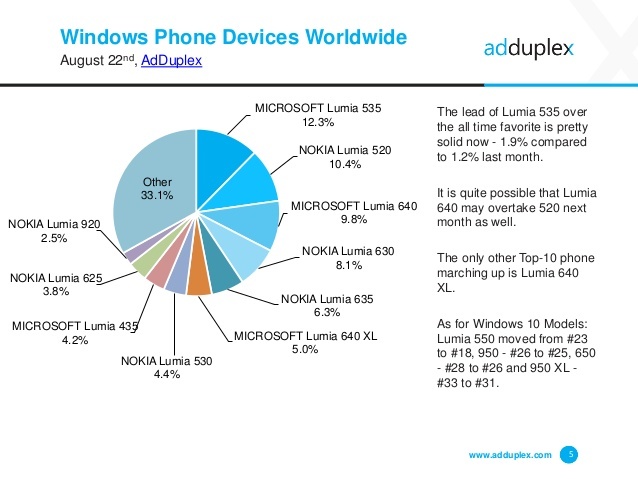 Every month AdDuplex reports on the top Windows phones in general and Windows 10 mobile devices in particular. According to this latest report Windows 10 mobile now accounts for 14 percent of all Windows phone devices on the market. This share of Windows 10 mobile is relatively low given that it’s approximately one year since its launch. Something worth noting is that this is an increase from June’s 11 percent. If you can recall the growth rate for last month doubled from 0.5 percent to one percent. The same scenario has been reflected this month as the growth rate more than doubled again an indication that probably the growth of Windows 10 mobile is accelerating each month. This could also be an indication that Windows 8.1 users are updating their devices to Windows 10 or the 8.1 users are leaving the Windows phone market. Still at the lead is Windows 8.1 with a market share of 77.3 percent. The not so popular Windows phone 8.0 has a market share of 6.7 percent. There is still a small group of individuals running Windows phone 7.x standing at 1.9 percent. An interesting twist is that the Anniversary Update accounts for more than half, read52.4 percent, of all Windows 10 mobile phones. This is surprising given that it is less than two weeks since it was released to the masses. More interesting is that the Anniversary update was just released this week for carrier supported devices. 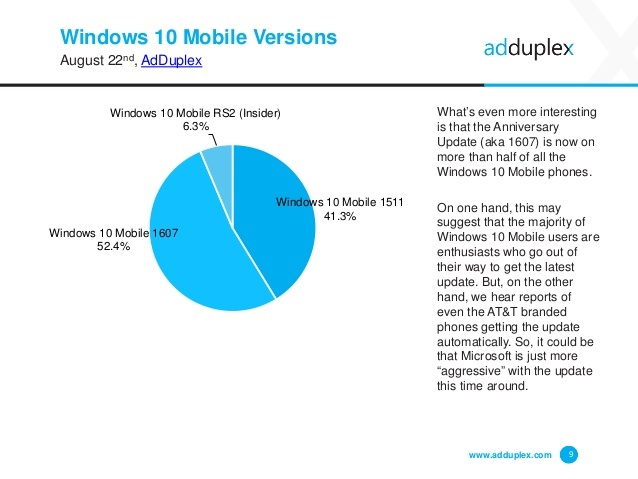 One point of view to support this massive adaptation of the anniversary update is that majority of Windows 10 mobile users are on the Insider program who received the update early. Alternatively it could be that Microsoft is more aggressive with the Anniversary update. The initial release for Windows 10 mobile, build 1511, now accounts for 41.3 percent of all Windows 10 phone devices. 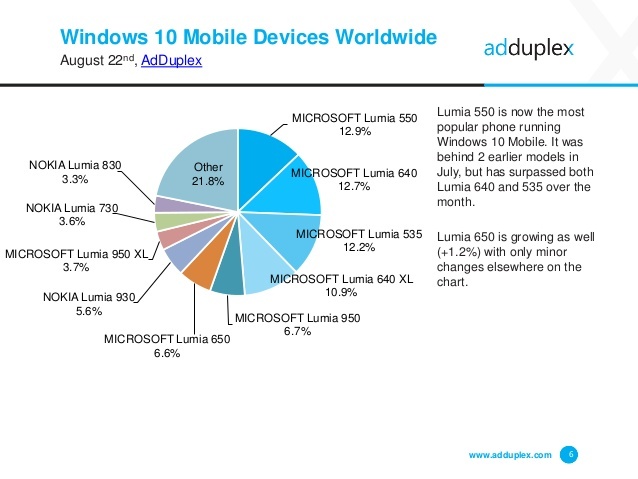 The Lumia 550 is the most popular windows 10 mobile. It now commands a market share of 12.9 percent. This is a slight lead on Lumia 640 and Lumia 535 with market shares of 12.7 percent and 12.2 percent respectively.